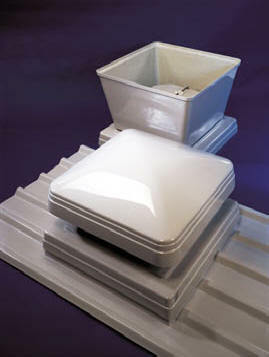 Fairhaven’s GRP roof cowls are ideal for industrial and commercial roof terminations. They can be used on their own fitted with an S&P plate fan to create a roof extract or supply fan. The low profile design of the horizontal discharge “RA” model gives excellent weather protection, whilst the vertical discharge “RV” version meets the requirements of applications such as commercial kitchen extract or fume extract where exhaust air needs to be expelled upwards. Manufactured from glass fibre reinforced polyester resin (GRP), and finished with a hard-gloss gel coat, they are supplied as standard in “Goosewing Grey” (BS00 A05), but a wide range of alternative RAL and BS colours are available. Unlike some other cowls where the finished colours are painted on, the colouring for our cowls is mixed with the polymer resin so there is no chance of the colour peeling off. RA models are fitted as standard with bird mesh, and are available with optional factory fitted backdraught shutters (for extract applications only).